The first panel comprised of appellate judges and senior members of the appellate bar and focused on tips for good appellate advocacy, with a focus on advice for recent calls. The second panel is made up of respected appellate counsel (defence and Crown) who are no longer recent calls, but not far off, and offered their perspectives on appellate strategy and oral and written advocacy. CLICK HERE TO ORDER THE WEBCAST RECORDING. 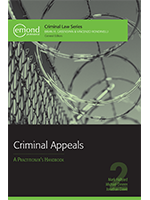 1 hard copy of the Criminal Appeals book for a raffle during the event.